Antarctica – the frozen wilderness of the South Pole! It has fascinated us for centuries and is one of the last untouched places on earth. Those ice fields still remain isolated and enigmatic. It is almost the end of the world where you only go by the rules of Mother Nature – her unpredictable character making each trip exceptional, thrilling and special. 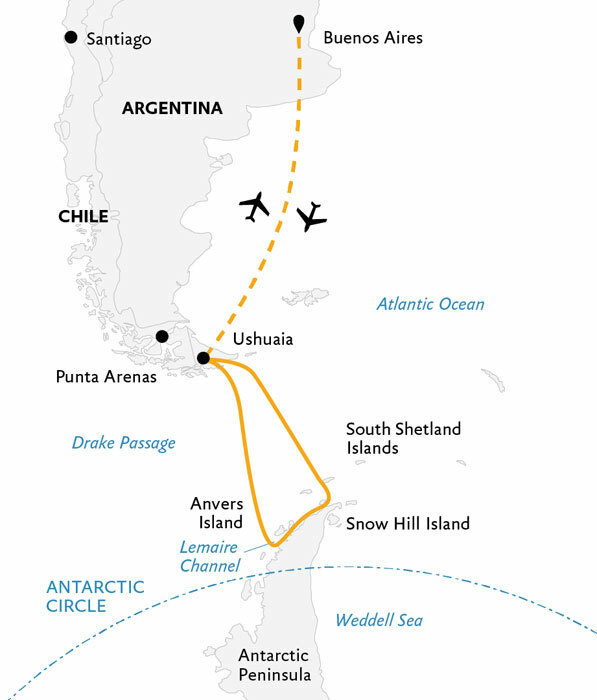 The expedition will begin from the southernmost city in the world, then taking you across the moody Drake passage and finally into the land of ice. 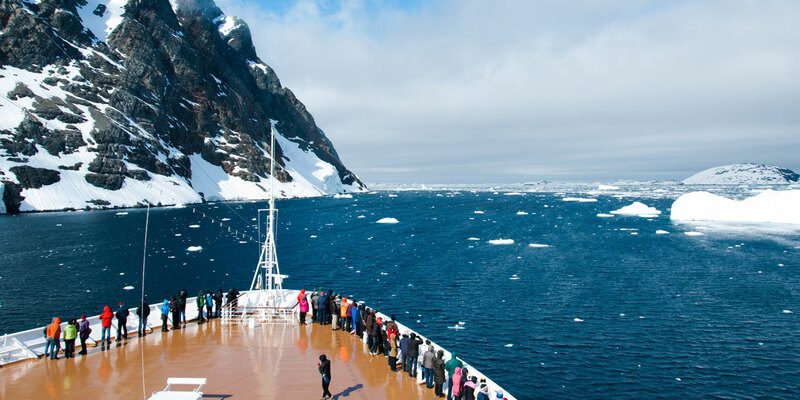 You will sail among snow covered peaks and glaciers, watch leopard seals on a hunt, witness chinstrap penguins at play and listen to the singing of the great whales of the deep. 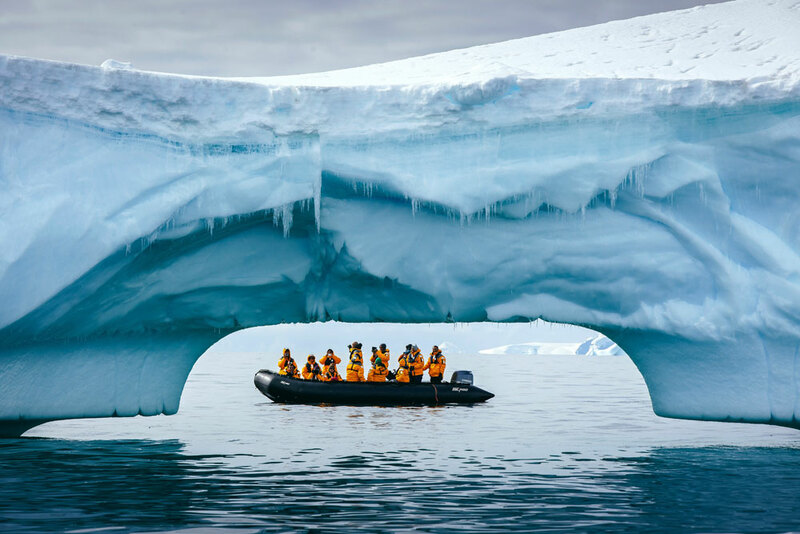 Enjoy iconic Antarctic highlights, exhilarating adventures and be rewarded with memories to last a lifetime. 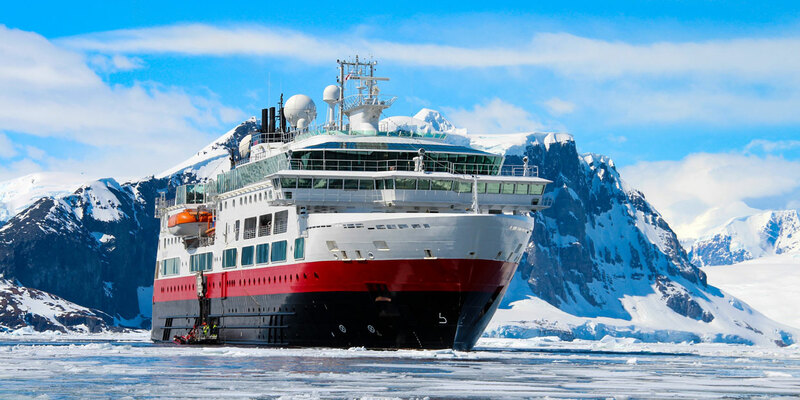 Imagine cruising in a Zodiac through crackling sea ice like shattered glass, witnessing penguins building their nests, or navigating through a maze of icebergs, each one uniquely shaped by its journey through the sea. Prepare for wonder on this journey and a discovery of what you are truly made of. “Nature’s colour-schemes in the Antarctic are remarkably crude, though often wondrously beautiful. Bright blues and greens are seen in violent contrast with brilliant red, and an accurate record of the colours displayed in a sunset, as seen over broken ice, would suggest to many people an impressionist poster of the kind seen in the London streets.” – Polar Explorer Ernest Shackleton. WHAT ALL CAN WE EXPECT IN AN ANTARCTIC EXPEDITION? 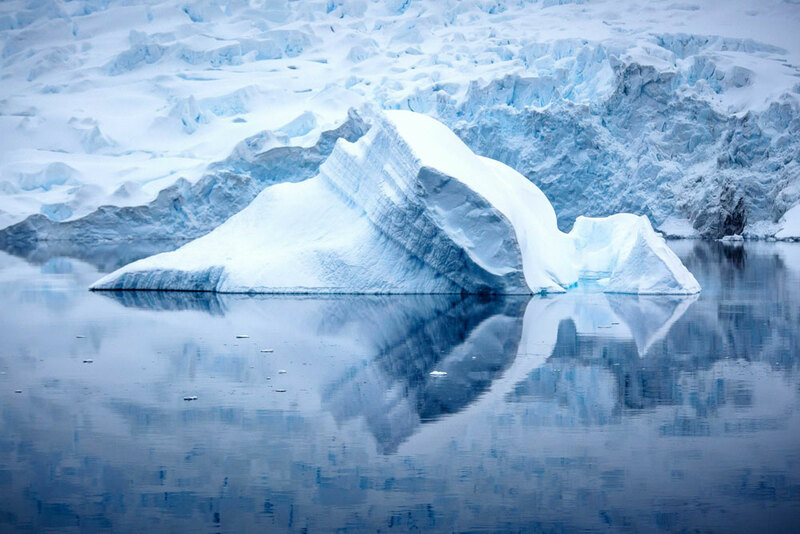 Discover high points of the Antarctic Peninsula – a multitude of drifting icebergs, ice floe, imposing glaciers and tall snow-covered mountains. Travel safely and comfortably aboard ice-strengthened expedition vessels. Learn about the environment and wildlife from on-board lecturers and specialists. Admire abundant wildlife like penguins, whales, seals, sea leopards and sea birds. Experience adrenaline rushing adventures including sea kayaking, camping and cross-country skiing (weather dependent). Visit the Bridge, where you can observe how the Captain and officers sail and navigate the ship. HOW DOES A DAYWISE ITINERARY TO ANTARCTICA LOOK LIKE? An adventure to Antarctica can be anywhere from 8-20 days depending on the traveller’s preferences. Have a look at one of the most popular of itineraries that lasts 11 days. With a population of about 63,000, Ushuaia is the southernmost city in the world. The city has grown over the past few years, yet it has retained an easy going and accessible feel. With the sea to the south and mountains to the north, Ushuaia is a spectacular departure point for your Antarctic cruise. If you arrive early, you can spend some time in the nearby Tierra del Fuego National Park, enjoy some Argentinean wines and barbeques, or visit the many boutique shops and cafés before leaving for your expedition to Antarctica. Embarkation will occur in the late afternoon, after which your vessel will sail down the historic Beagle Channel. This channel transects the Tierra del Fuego archipelago in the extreme south of South America. Expect an air of excitement as you depart! The next time you see land you’ll be in the world’s southernmost continent! Prepare yourself for potentially rough waters, but hope for a smooth sailing as the Drake is unpredictable and always changing. You’ll spend these first days getting to know your shipmates while your Expedition Team provides safety briefings and insights into what excitement lies ahead. 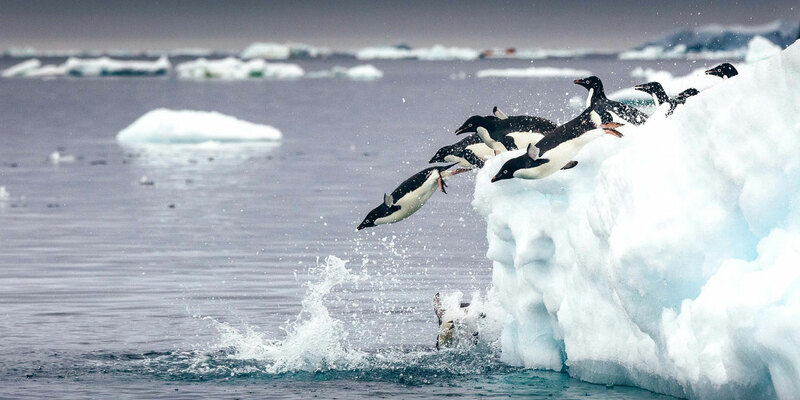 Once the Antarctic Convergence is left in our wake, you will truly begin your adventure. It is perhaps the first sight of land itself that is embraced as the true beginning of any Antarctic expedition. You will begin to appreciate why this region has long captivated the attention of explorers and travellers alike. Every time we visit Antarctica, we witness something new or unexpected, which means that your expedition will be unlike any other – creating a unique, personal experience. The majesty of the Antarctic Peninsula’s mountains will enchant as you scramble up snowy pathways to vantage points offering 360° views of your surroundings. One of these in particular, in Danco Island, affords us the opportunity to visit a penguin colony high up on a ridge. 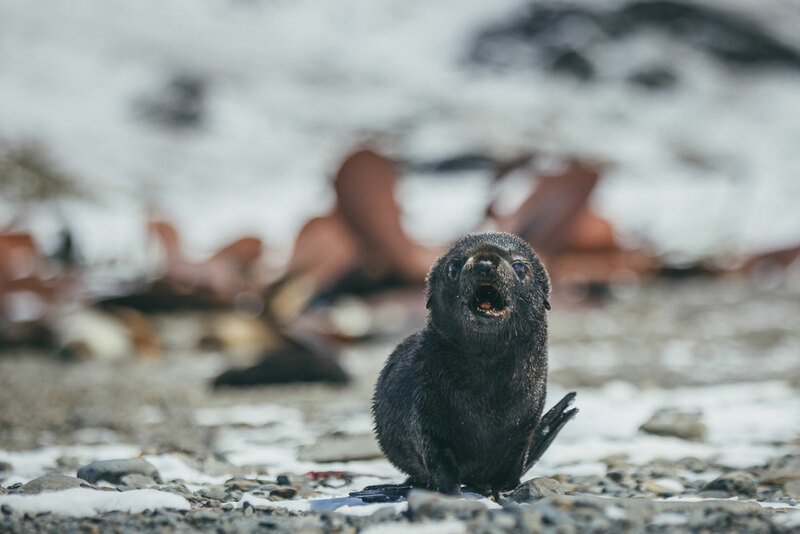 Here, you’ll have the choice between hiking to the island’s summit or spending time sitting quietly on a pebbled beach, enjoying the antics of curious penguins. If you’re feeling extra adventurous, participating in the Polar Plunge swim is about as crazy as it gets! You will arrive in Ushuaia in the morning. Continue your adventure in South America or catch your flights home. HOW ADVENTUROUS WOULD IT BE? Very Adventurous! Multiple recreational pastimes are offered free on all voyages. Morning and afternoon excursions to cruise the waters via Zodiac or shore exploration are part of the regular daily schedule. Hikes are led by experienced staff. Be sure to take your camera with you, photography is very much a part of the big picture. 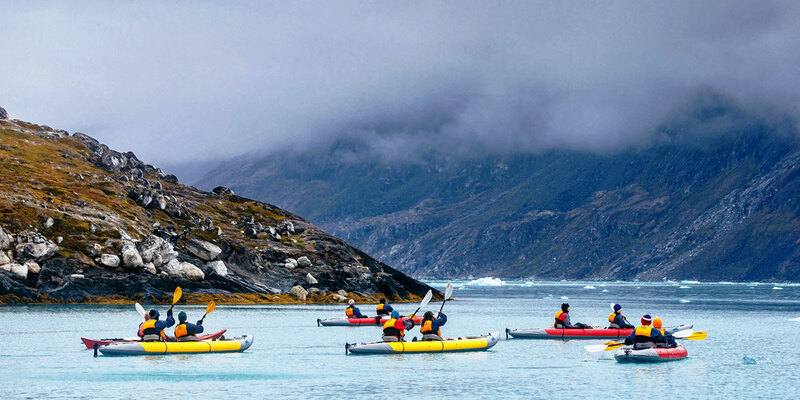 SEA KAYAKING – Glide through the quiet waters and take in the beauty of Antarctica. Paddle through astounding icebergs, watch penguins, seals and possibly whales swim around your kayak. 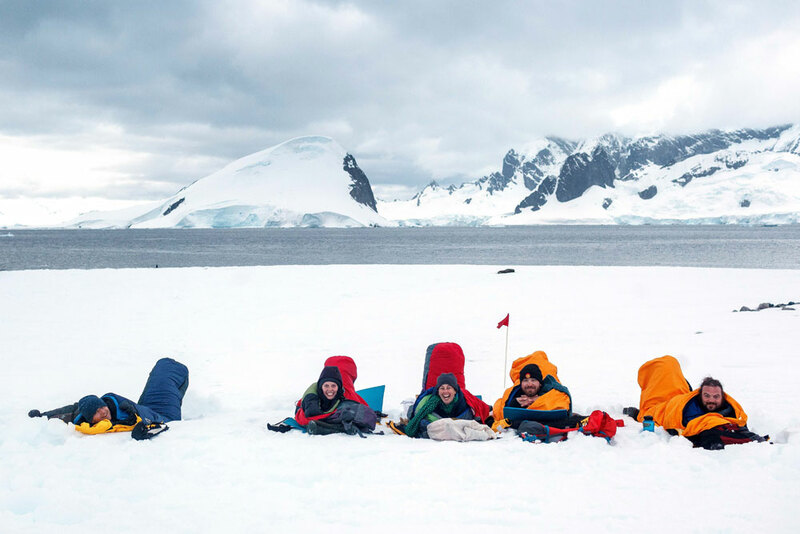 CAMPING – Treat yourself to an overnight camping adventure in Antarctica! This is one of the best ways to experience Antarctica in an intimate manner, and take your expedition to the next level. STAND-UP PADDLEBOARDING – Combining surfing with kayaking or canoeing, stand-up paddle boarding will give you a very personal and unique perspective on Antarctica. CROSS-COUNTRY SKIING – If you love cross-country skiing, why not experience it on pristine Antarctic snow? All you’ll hear will be the sound of skis gliding through the fresh snow as penguins provide the soundtrack to your journey. (Cross-country skiing is available on select Antarctic voyages at the beginning of the season). 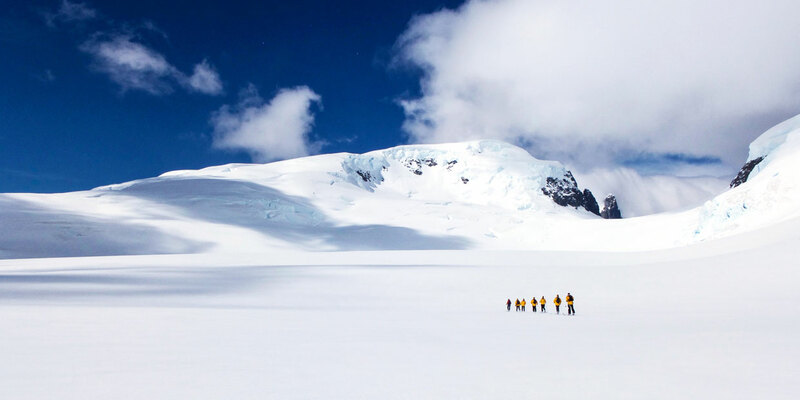 MOUNTAINEERING – Mountaineering in Antarctica is not for the faint of heart. This option is geared towards the more adventurous travellers, but is quite a rewarding experience. PADDLING EXCURSION – Explore the ocean from a more intimate vantage point on a sit-on-top kayak. No experience is required to manoeuvre these very stable kayaks, allowing you to enjoy an unforgettable experience on the water, taking in breathtaking landscapes and wildlife. SNOWSHOEING – Experience the 7th Continent the way explorers of yesteryears did – by snowshoe. Walk atop fresh snow and visit places that are inaccessible by foot. 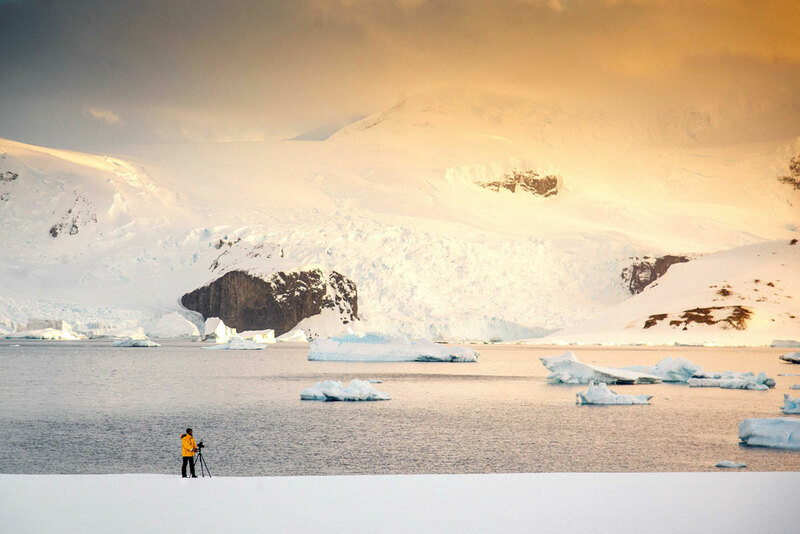 (Snowshoeing is offered on select Antarctic voyages at the beginning of the season). WHAT ALL WILDLIFE WILL WE GET SEE? 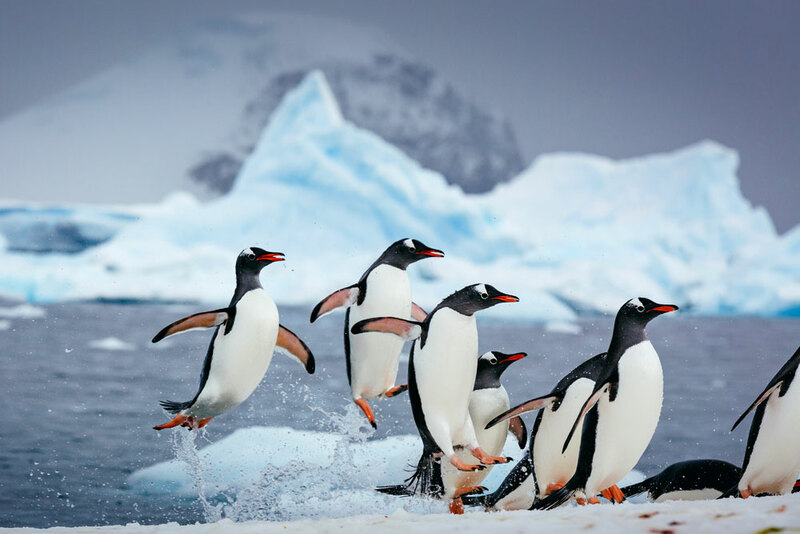 Penguins – Gentoo, King, Macaroni, Adelie and Chinstrap. Whales – Humpback, Minke and Orca Killer. Seals – Elephant, Leopard, Crabeater and Weddell. Sea Birds – Albatross, Petrel, Tern and Suka. WHAT ALL CAN WE DO BEFORE & AFTER THE TRIP? You can extend your trip by booking extra days to explore South America before or after the voyage. Since you’re travelling such a long way, you may want to spend extra time in one of the gateway cities or add on another region, like Easter Island, Chile, or Machu Picchu, Peru. There are a variety of pre and post-expeditions to the fascinating cities of Santiago, Buenos Aires, Ushuaia or the region of Patagonia. Enjoy a cruise to Penguin Island near Ushuaia, trek and canoe in Tierra del Fuego National Park, enjoy a tango show in Buenos Aires or stroll the catwalks over Iguazu Falls. The best options for extending your adventure can be discussed while planning the Antarctica vacation. The return trip from India to South America and the expedition from South America to Antarctica and back starts at USD 9000 on sharing basis. It goes up from there depending on the trip duration and the level of luxury required.